Truth hurts: you do not always have the time you would like to visit a city. In this article we describe you about 4 places to visit to get to know the historic centre of Naples in a very short time: a day or even a morning, depending on the time you have. Along Spaccanapoli you have the chance to reach the main attractions and landmarks of the city. The churches to visit near this road are the Cathedral, the San Domenico one, the Gesù Nuovo one and the monastery of Santa Chiara. The main squares that you cross walking on this street are San Domenico and Piazza del Gesù. Spaccanapoli is close to important museums in the historic centre of Naples such as the national archaeological museum MANN and the museum of contemporary art Madre. 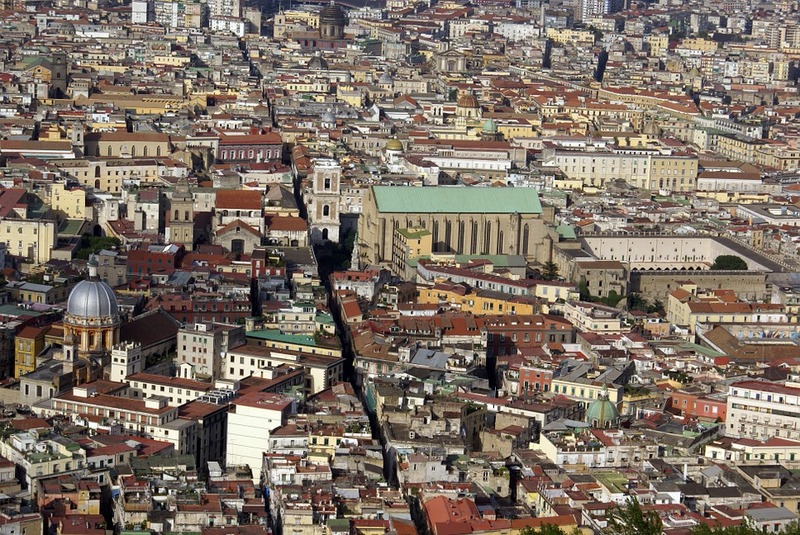 Spaccanapoli is an even more fascinating seen from above: many famous photos show how this road splits the historic centre of Naples in two. The Sansevero Chapel is one of the most famous attractions of the historic centre of Naples. The reason is because it hosts one of the most mysterious artworks of the city: the sculpture of the veiled Christ. The legend tells that the prince of San Severo, an illustrious alchemist, covered the sculptured body of Christ with a veil of fabric then turned into marble thanks to a liquid he invented. The sculptor who created this masterpiece is Giuseppe Sanmartino. The Archaeological Museum of Naples is one of the most important in the world thanks to the prestigious quality of the numerous statues and artworks. Opened in 1816, in the heart of the historic centre of Naples, it was first a riding school and then university. In the rooms of the MANN Museum you can see findings of the excavations of Pompeii, finds from the Greek-Roman age, Egyptian and Etruscan antiquities and ancient coins. The historic centre of Naples is the place through which you can reach the underground of the city, one of the attractions of the city. In ancient times, the tuff, a local material used to build important architectures such as the Academy of Fine Arts and Sant’Elmo Castle, was obtained from the underground of the city. Afterwards, the underground areas were then used as shelters during the world wars and as a hiding place for criminals. Today it is possible to visit the underground from Via dei Tribunali or from the Galleria Borbonica near Piazza Plebiscito.